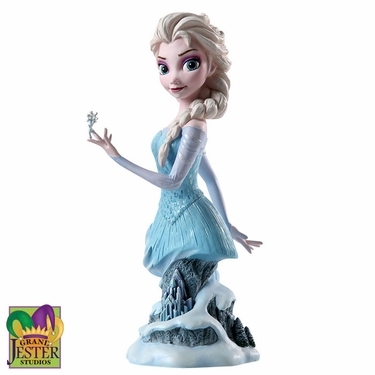 Once again, they did an amazing job with this Elsa figurine - incredibly sculpted with fine detail that will blow you and any recipient away, Guaranteed! We'll let the images speak a thousand words of praise! "On the day Elsa is crowned Queen, the icy beauty inadvertently reveals her frightening secret, projecting freezing blasts of snow and ice which lock her kingdom into a never-ending winter. In a self-imposed exile, Elsa finally embraces her wild power." Size: 7.25"H x 2.75"W x 3.5"L, Stone Resin. Comes in Gift Box. Felt pads on bottom to prevent surface scratching.